" lyrics or quotes here "
Flan is a slender woman of around average height, with a somewhat long, narrow face. Her features are rather soft, with a small, broad nose and wide lips. Her hazel eyes are somewhat wide-set and fairly small; her eyebrows, on the other hand, are dark and thick. She has rather large ears, though they're slightly covered by her dark brown hair, which is kept cropped short and is eternally in a state of slight fluffiness. Her skin is slightly tanned, but she also tends to freckle, especially around her nose and cheekbones. Her left forearm bears a jagged, semi-circle scar from a childhood canine bite, and there's a number of narrow, criss-crossing scars on her back that she usually tries to hide. Flanieu, usually called Flan, is an extremely driven, ambitious young woman who wants nothing more than to get out of her life of drudgery. She will stop at nothing to attain that goal, though she would prefer to end well up the social ladder. To this end, she often sets her sights on various Lords Holder, hoping that they’ll notice her and marry her and elevate her to the status she so desires. Of course, they usually fail to notice that she even exists, and she generally just gets scolded for being somewhere she isn’t supposed to be. However, when she is addressed, she is very polite and attentive, and possibly even a little charming. Though just a little, for what she possesses in politeness, she lacks in refinement; her company has largely been other drudges, and as such she has difficulty treating anyone else as an equal despite her desire to be so. She is usually fairly meek, hiding her ambition well, though some might notice that when she thinks nobody is looking, she holds her head a little higher. Despite her personal drive and focus, Flan actually hates work, especially the drudge work she’s done most of her life. She absolutely abhors it. If she never had to lift another finger again, she wouldn’t be bored; she’d be utterly overjoyed. She hates dirt, and doesn’t like the outdoors much either due to just how much dirt is out there. She also isn’t particularly fond of working with animals, and is actually terrified of canines due to an incident with one in her childhood. Flan likes to think that she stands against tradition and structure, that she’s a revolutionary that, with influence, could change the world. In reality, she’s actually rather traditional, being somewhat uncomfortable with the idea of anything that breaks from her experiences. She’s highly concerned with rank and who holds higher societal positions, and the thought of women on bronze and wrong-colored dragons makes her squirm a little inside. She doesn’t deal particularly well with change in any form, despite wanting it, and is largely a creature of habit. Her leadership skills are sub-par; she knows how to follow, not how to direct others, and she’ll almost always defer to other people in any matters of importance no matter what her opinion. Unlike the seven children born before Flanieu (named for her mother and something that sounded rather suspiciously like “new”), her mother wasn’t entirely certain who the child’s father was, since her partner had been away helping out at Fort Weyr for the space of a few months. She knew it was one of three men, but she never did find out exactly who, and refused to ever tell her daughter who the possibilities were. As such, Flan grew up without any sort of meaningful father-figure, instead of relying on her seven older half-siblings and her mother to raise her. Her mother’s partner, and the father of the other children, largely ignored her presence entirely. All of them were drudges; it was something of a family trade. Her mother always said it was honorable, important work, something someone had to do, and it might as well be them that had been all but born to it. Flan, however, was never particularly pleased with that outlook. She didn’t want to be put to work cleaning! She wanted to be someone important, someone like the Ladies who wore beautiful dresses and stood with their heads high rather than with eyes cast downward. Of course, all attempts to imitate said ladies in countenance led to her being scolded and told that a drudge need not look haughtily at the world around her. The slight rebellious streak she nurtured said otherwise, but she was certain to practice her more ‘lady-like’ expressions when she was certain that she was alone. From a fairly young age she was expected to help with chores in whatever manner possible. However, until she was eleven or twelve her duties were fairly limited in nature: pick berries when the weather permitted, or wash tubers, or sweep the hallways, or occasionally help watch after her little sister. It was then that she had an unfortunate run-in with a grumpy canine who didn’t particularly want to be petted, and she received a nasty bite on her arm for her trouble. After that, she was assigned duty as a scullery drudge. That didn’t last particularly long. For some reason, whenever Flan entered the kitchen, things tended to go poorly. It wasn’t her fault, exactly, but when she was in the kitchen scrubbing the floors, an entire day’s worth of bread caught fire. When she was cleaning pots, a bag of flour exploded all over the floor. When she tried to put away dishes, another shelf—one she never touched—collapsed, shattering quite a large number of plates. She was never permitted in the kitchen again, and was put back to work helping as a sort-of chamber drudge, though she largely had the inglorious duty of cleaning out fireplaces. For Turns her resentment grew. Her relationship with her family, never wonderful, deteriorated rather quickly past her fourteenth Turn-day. Her mother berated her for lacking ambition, since she had failed to get any duties beyond those she’d done for over two Turns. Her siblings teased her, calling her “Cake” and “Soufflé” and wondering aloud when she’d come do the easy—or at least cleaner—work in the kitchens. She never resorted to physically fighting any of them—why bother when they were almost all older than her?—but she did resolve to figure out a way to get out of her life. With no skills beyond cleaning, and no particular talents that she knew of, she could hardly attempt to apprentice to a Craft, but she could hope to catch the eye of a Lord Holder, even a minor one, and find a better life through marriage. So she started dallying about at her duties, just a little. Enough that she hoped nobody would notice, but if she timed it right, she might encounter a visiting Lord when he returned to his chambers. She hoped. Of course, she could never tell which were married beforehand, and it was hardly like she could ask. She also wasn’t particularly presentable at the end of the day, largely covered in ash, but she hoped some amount of charm would serve her well. The one time she managed to be in the room, however, ended anything but well for her: he turned out to be in a rather foul mood, and she was flogged for her trouble and ended up spending a couple of weeks in the infirmary. That hardly deterred her, she just changed her tactics to hoping to meet them in the hallways. That still never went especially well for her, resulting in a number of scoldings, but she was never punished so severely again. Turns passed much the same, nothing ever really changing for her. She still wasn’t allowed in the kitchens; she went once, to retrieve a plate of pastries, and while she was there one of the cooks slipped on a piece of tuber peel and broke his wrist. Needless to say, she wasn’t welcomed back. Endlessly she hoped, waiting for something, anything to change. Has grown a little more backbone than she once had, even if most of it is dedicated to dealing with Kajth and she still defers to just about everyone else. Kajth chased Serapheth twice; she does not appreciate him at all. A large brown by almost any means, Kajth keeps his head high and proud and walks with a purpose. He's a sandy, peachy brown all over, with dark brown wings. The edges of his wingsails have bright, inverted "V" shapes on them that look not unlike horrifying eyespots when he flares his wings quickly. His face is a pale, almost bone-pale color, with little darker marks on his cheeks and chin, almost making it look like he is wearing a mask. Over his feet, neck, shoulders, and legs, are golden-brown ribbons that seem to just be there to make him look prettier. 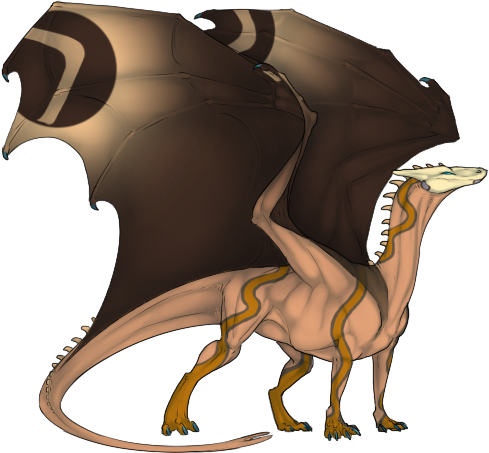 For his size, he's remarkably agile, with a narrow face and large wings. Hey kids, Handsome Kajth here. Yes, Kajth is that vain. Most of the time, he will introduce himself with 'handsome' in front of his name. He is a confident, arrogant sort of jerk who walks with his head held high and he tells everyone that he is better than them. Yes, he is a jerk. He's unfortunately a very charismatic jerk. He's good with words and making whatever he's doing seem like the right thing. He's got an incredible hatred for Holdless people and anyone he decrees as a 'bandit', and he would like nothing more than to take over Pern and make the world a safer place... by his standards. Nothing sets him off more than being betrayed, and he will rampage unless someone keeps him in check. To his rider, however, he's not a jerk. He is incredibly devoted to his human, and their family. He'll be the first to call a healer if they're sick, to fly out to Healer Hall and shout loudly until someone helps him, to do anything to ensure that they are safe. In public, he will continue to be a massive jerk (to everyone except his human and their family). He's not a dragon who makes friends easily, preferring to strut around with his holier-than-thou attitude. He likes it that way. The only exception to this social circle barrier is Doukajth, who, despite not sharing an egg with him, Kajth considers this dragon his twin, his best friend, and his only real brother. Voice: Kajth sounds handsome, not gonna lie. He's got a smooth, masculine voice with nothing but charm.